Drums. Lots of them. Lasers. Strobes and some confetti too. But beyond all the pomp and circumstance exists a message. 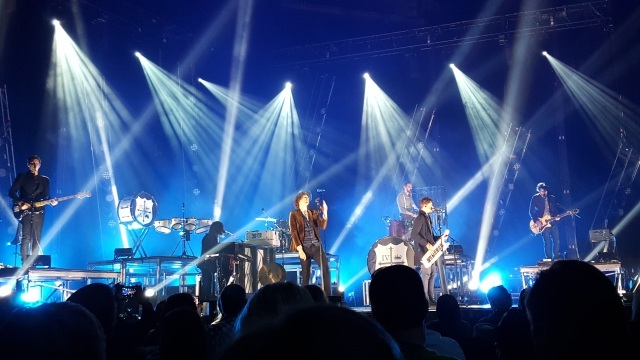 A message of hope and love delivered the best way for King & Country knows how. The pop duo hailing from Australia, sort of, recently commenced their current world tour and brought a show that’s less rock concert and more marching band on steroids to the Keller Auditorium on Sunday in Portland, OR. It wasn’t a sold-out crowd, far from it, but fans ranging in age from tween to 60 and above filled the entire orchestra section and the first few rows of the second level . Actually, you could call them the Australian Imagine Dragons but for King and Country is very much American as the family moved to the United States from down under 25 years ago. They bring sometimes breath taking drum beats just a few steps away from electronic dance and the stage show is immense incorporating a visual display that rivals bigger more mainstream acts playing large venues. 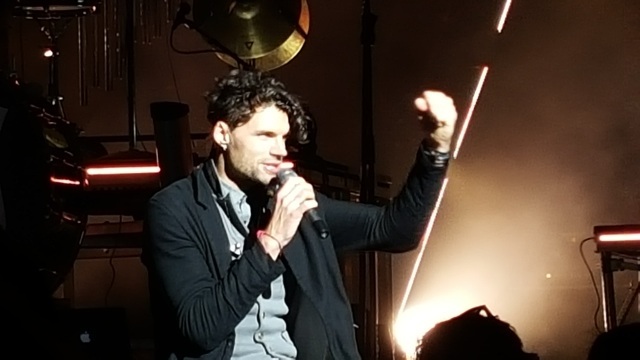 for King & Country (yes little “r”) played a 16 song set over the course of nearly two hours diving deep into their latest album Run Wild. Live Free. Love Strong. released in 2014 with a deluxe anniversary edition offered last year featuring a few extras. The band, fronted by brothers Joel and Luke Smallbone, kicked things off with a shower of confetti and started the show with “Run Wild” then “To The Dreamers” before firing off three straight from their 2012 debut album Crave – “Fine, Fine Life,” “Light It Up,” and “Middle of Your Heart” where the brothers ventured out into the audience throwing out high fives and even climbing into the aisles and standing on chair armrests all without skipping a note…or falling. Back to the latest release with “Priceless” which also doubles as the title to a new movie out later this year, produced by for King & Country and featuring Joel in an acting role. The title track to Crave came next followed by “The Proof of Your Love” the single and smash hit which put the band in the hearts and minds of it’s listeners. It was truly an amped-up version getting special treatment as the Smallbone’s and the rest of their band stood center stage, spread out single file, much like a drum line. The finishing touches was smashing as they went into a fast jam using the variety of solo drums and percussion sets on stage. It wasn’t all music all the time as Joel introduced “Priceless” – thus giving a hint as to the plot of their movie – by emboldening girls to believe in themselves, avoid bad relationship and not get caught up in the worldview of how a woman should look. At the same time he charged the men in the audience to respect their counterparts. After “Proof” concluded Luke discussed the band’s involvement with Compassion International, a worldwide child sponsorship ministry, encouraging the audience to check the organization out and offered a complimentary copy of their latest album to anyone who signs up for a month of giving. A 20 minute intermission ensued, unusual to say the least, just eight songs in and it felt like for King and Country were just getting started but in many respects it made perfect sense. The time off stage took the focus from the band and turned it on to the non-profit organization as not many would likely take time out post-concert. The band made a triumph return using lots of bass drum with “No Turning Back” off the latest album then back to Crave with the fun and upbeat “Busted Heart (Hold On To Me).” “It’s Not Over Yet” brought out the “string section” as Joel called it which consisted of a cello and violin but sounded like so much more. The band wrote much of Run Wild. Live Free. L0ve Strong during a health scare for Luke who battled ulcerative colitis a few years ago which got so bad his wife and parents questioned whether he’d survive. The experience led Luke to write including “Without You” which he delivered beautifully along with that excruciating lyric I don’t want to live without you/I’m not ready to live without you. Luke said the idea behind the song developed when he realized the time to rejoice is when were most in pain not when things are going well. The duo is backed by five other well-accomplished musicians, indeed one held a trombone while a bass guitar dangled from his neck. The seven function as a cohesive unit interchanging instruments often. Joel, 31 and Luke, 29 show a remarkable sense of self-awareness which is not only evident in their lyrics but their urging on of fans to be apart of something bigger than themselves, certainly for their King and perhaps for their country. The Smallbone’s come from a family of musicians, their sister is singer Rebecca St. James, and neither one shy away from their strongly held Christian faith. Yet, they figured out a nice balance mixing their message into a musical style that certainly resonates with the masses. At the end of the second set, Joel gave a benediction of sorts and indeed called his charge to the audience in making a difference with their lives, just that. Little did anyone realize up until this point, they just had a worship service, without attending church.